Bicycles, Testicles, and French Nicole Kidman…the rush of speed on the senses, the power of the pedal on the environment. Movie trivia from the genre trenches. Is an homage a rip off or a celebration? I prefer to think of imitation as the sincerest form of flattery. All genre directors try their hand at a range of standard set piece sequences on widely differing budgets, with varying degrees of success. If the result is still engaging an audience on DVD and Cable channels 26 years later, that’s gratifying, but a genre director really gets his rocks off when one of HIS films gets imitated! As a warm-up, here’s a BMX Bandits trivia collectible: Nicole’s first scene in the film is taken from a French language print. It kinda plays better in French, don’t you think? Did the actress in the Paris dubbing studio know she was French-voicing a future Academy Award-winning star? Did she do Nicole’s voice in other French releases? Did it grow into a good living? I wonder about things like that. How often does one of the invisibles of our celebrity obsessed trade become the recipient of windfall good fortune? Over to you, French Showbiz researchers. OK. Now take a look at this. A 30 second Australian TV commercial for BMX Banditsthat played Christmas 1983. The film was such fun to make. Perhaps it shows. Please note the 2 year old kid at the end. We’ll get back to him in a moment. Now here’s a BMX Kung Fu sequence from Lady Is The Boss produced by Hong Kong’s Shaw Bros., directed by Chia-Liang Liu. They even imitated the costume design. Good for them! I wish I had included a martial arts fight in my building site chase sequence. Eric has a license but does not want a car. He bikes to work, in order to reduce his carbon footprint. I am proud to have a son who follows through on his principles. It’s one thing to talk the talk, it’s another to pedal 9 miles each way and save on all that carbon monoxide. We should all seriously think about using bikes for our short range travel. Walking’s good too. 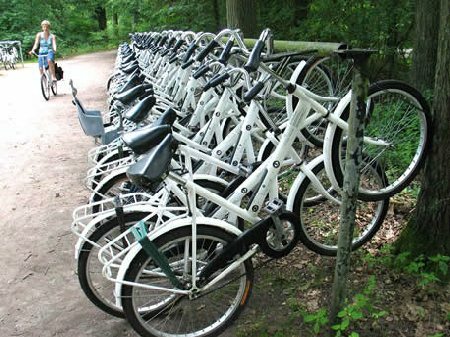 The Dutch city of Groningen sets a great example by creating a bike friendly environment. Their view is that cycling is the life blood of the city, and have prioritized urban planning accordingly. Look at the space saving in this bike parking lot. Bicycles and pedestrians rule the medieval-era city hub, cruising along on car-free dedicated pathways and short cuts. People also commute on bikes in large numbers from suburban housing spread out around the city to downtown jobs, via a ring-and-spoke network of paths. Population 185,000. A recent survey counted 150,000 bike trips per day. Bicycling is also good for your health. For those in the LA area, I recommend WHEEL WORLD in Culver City as the best place for a reliable purchase. Ask for Eric. My son introduced me to some real life footage of bike messengers racing through the streets of New York. Check out this video. The audio has been removed for copyright reasons, just jog forward to 50 seconds. I think it will pique your interest. Those guys (and gals) have big brass balls. If you are in the mood for more, this time with musical accompaniment, here’s one of Lucas Brunelle’s hair raising adventures in urban traffic across the world. Now there’s a Stunt Rocker! Guess what? There was even a bicycle film festival in San Francisco…. This blog was originally published by Brian Trenchard-Smith on Film Industry Bloggers.